Catcher Johnny Riddle had one of the more unusual careers in major-league history. His big-league career spanned 19 years, from his debut with the Chicago White Sox in 1930 until his final game with the Pittsburgh Pirates in 1948. He played for five major-league teams, but he also spent long stretches of time in the minors, the longest from 1931 to 1936. In fact, during the 19 years he appeared in only seven major-league seasons and 98 games. In contrast, in his minor-league career, during which he spent 12 years with the Indianapolis Indians, he appeared in more than 1,600 games. He had earned his nickname, Mutt, by the time he played freshman basketball and football at the University of Georgia, but his son, John, said he didn’t use it much in later years. Riddle made some interesting memories for others. In 1940 he was responsible for what sportswriter Sam Levy called one of the “greatest and oddest double play(s) this veteran reporter has ever seen.” Playing for the Kansas City Blues in an all-star game, he tagged out both John Lucadello and Ab Wright at the plate during the same play. He was also one of a brother act in baseball, in fact working a game for the Pirates with his younger brother, pitcher Elmer Riddle. Johnny and Elmer also played together when they were with the Cincinnati Reds, and in the minors with the Indianapolis Indians. During Johnny’s last season as a player, in 1948, he was the oldest National League player to appear in a game, and was part of one of the oldest batteries in baseball history when at the age of 42 he caught for Fritz Ostermueller, who was 40. And he was to be a five-time American Association all-star. John Ludy Riddle, the eldest son of James Ludy Riddle and Susan Rebecca Crosby Riddle, was born on October 3, 1905, in Clinton, South Carolina. The family left Clinton sometime before 1912, and Johnny spent much of his youth in Columbus, Georgia. In 1920 he was living in Columbus with his parents, brothers James, Edward, and Elmer, and sisters Lillian and Frances. The father was working as an overseer in a cotton mill, his son James was a commercial traveler for Moisture Co., and Edward was a timekeeper in a cotton mill. The Riddles were to become quite a baseball family. 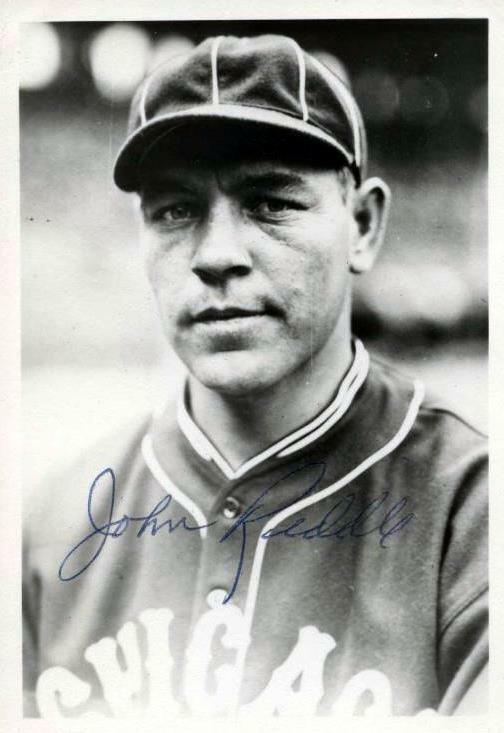 Besides Elmer and Johnny, Johnny’s son John L. Riddle spent several years in the minor leagues. Johnny’s nephew, Chase Riddle, managed in the minor leagues, scouted for the St. Louis Cardinals, and later was the longtime baseball coach at Troy University in Alabama. Johnny’s father died in 1928, when he was 23 years old, and Johnny helped to support the family and ensure that his younger siblings would be able to stay in school. By 1930 his sister Lillian was also working, having found a job in a candy factory. Johnny spent 1929 with Indianapolis and in 1930 the Chicago White Sox brought him to spring training. His prospects looked good. In fact, according to a Chicago sportswriter, “(W)ithin a few months [he] will develop into one of the outstanding young catchers of the majors.” Riddle made his major-league debut on April 17, 1930, in a game against the Cleveland Indians. He played in 25 games with the White Sox that year, the most major-league games he would play in a season. He batted .241 in 58 at-bats. But things didn’t pan out as hoped, and Riddle was to spend the next seven years back in Indianapolis. The years were not wasted, however, as it was there that he met his wife, Dorothy Cutshaw, in 1932. They had a whirlwind courtship, meeting on June 18 and marrying on July 30. Despite her father’s objections to her marrying a baseball player, their marriage lasted for more than 60 years. In 1937 the Washington Senators acquired Riddle from Indianapolis in a trade for catcher Shanty Hogan and an unspecified amount of cash. The Senators, however, were not pleased with their acquisition, and protested when an X-ray of Riddle’s arm revealed several bone chips and a large growth. After Riddle had played in eight games for the Senators, the trade was voided and the players returned to their teams. Johnny returned to Indianapolis, where he joined brother Elmer on the roster. On August 30 the Boston Bees acquired Riddle from Indianapolis, and he played with them through most of the 1938 season. He was the Bees’ third catcher, but was praised in local sportswriters as being “a real big leaguer,” and “one of those 100 per cent team men.” He batted .281 in 19 games with Boston in 1938, and on June 12 he had the best offensive game of his major-league career, going 3-for-4 with a double. On July 4 against the Philadelphia Phillies, he participated in an outstanding force-out at third base, and the Boston Globe praised him for his “wonderful faculty of being ‘there or thereabouts’ on every possible play in his sphere of influence.” The next month the Bees included Riddle and several other players in a trade to the New York Yankees for shortstop Eddie Miller. The Yankees assigned Riddle to the Kansas City Blues, their American Association farm team. He broke his thumb in his first game but managed to play in 19 games for the Blues that season. He played in 97 games in 1939, and 109 in 1940. In the latter season he batted .280 and had a fielding percentage of .986. In March 1941, his contract was purchased by the Cincinnati Reds. Ernie Lombardi was the Reds’ primary catcher, and Riddle played in only ten games. Elmer was a teammate that year; they were to play together with the Reds again in 1944 and 1945. Riddle played sparingly for the Reds in 1944 and 1945. World War II ended in 1945 and Riddle was released by the Reds on September 11. He returned to Indianapolis, where, now in his 40s, he played in 1946 and 1947. He was one of the most popular players in the Indians’ history. In August 1947 the fans showed their appreciation of his long career at John Riddle Night. He received a $500 check and a Nash Ambassador automobile, and was carried off the field on his teammates’ shoulders. He was later named to the All-Indians team by readers of the Indianapolis News. In 19 seasons in the minor leagues, 12 of them in Indianapolis, Riddle played in 1,296 games, had a fielding percentage of .977, batted .297, and sported a slugging percentage of .390 and an on-base percentage of .302. He batted over .300 during six of those seasons, with his best year coming with Indianapolis in 1930 when his batting average was .359 and his slugging percentage was .405. He even pitched in seven games (11 innings total) at Birmingham in 1944. In 1948 the Pittsburgh Pirates acquired Riddle to be a player-coach. He served mostly as the bullpen coach until the Pirates activated him when none of the other catchers could handle Kirby Higbe’s knuckleball. He caught in ten games, the last one on September 11, and was released after the season, though he continued to coach. In the course of his major-league career, he appeared in 98 games, batted .238, and had a fielding percentage of .983. In four of those years, 1930, 1941, 1944, and 1945, he was perfect defensively. 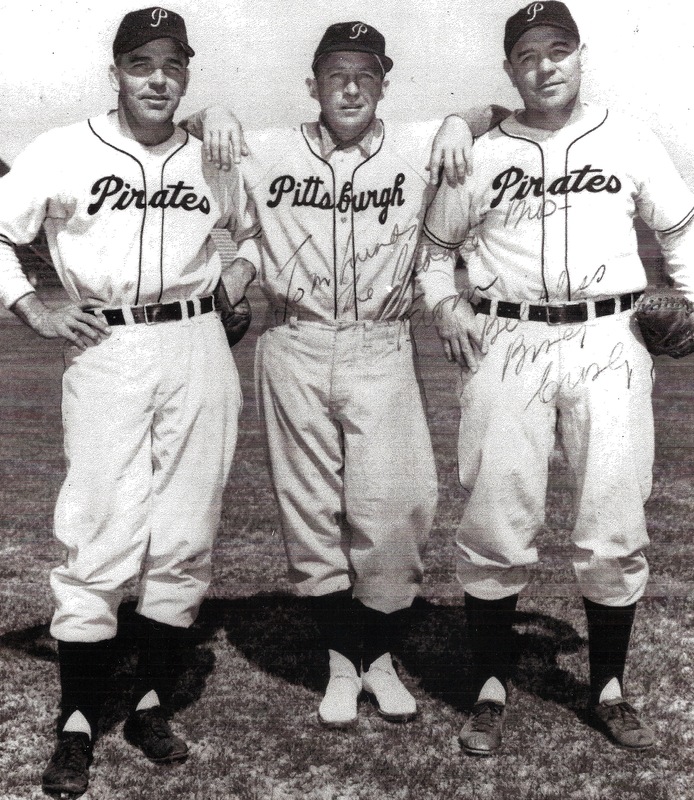 During the 1948 and 1949 seasons, he was again reunited with his brother Elmer on the Bucs’ roster. Johnny was a coach for the Pirates until 1950, and from 1952 through 1955 he was a coach for the Cardinals. Catcher Del Rice, who played under Riddle at St. Louis, called him “one of the smartest and hardest-working coaches in the business,” and added, “He’s an excellent infield (practice) batter, can pitch and catch batting practice, and is known around the league as a terrific judge of play.” In 1953 the Cardinals signed his son, John Louis Riddle, a student at Butler University, to a minor-league contract. John Louis, an outfielder, played in the minor leagues until 1957. While many players’ families remained behind in their hometowns during the baseball season, Dorothy Riddle and her children followed Johnny to many of the places where he played and coached. One of John Louis’s Riddle’s earliest memories is spending the summer in Boston when his father played for the Bees. When Johnny managed the Birmingham Barons, the family went to Alabama. During the two years he coached for Pittsburgh, they lived in the Pittsburgh area during the summers, one year in East Liberty and one in Mount Lebanon. And when he went to coach with the Cardinals, the whole family moved to St. Louis for several years. In 1956 and 1957 Riddle was a coach for the Milwaukee Braves. The Braves won the World Series against the Yankees in 1957, an event that Riddle often referred to as the biggest thrill of his career. After the Braves’ World Series triumph, Riddle and two other coaches were let go by manager Fred Haney in what Harold Kaese of the Boston Globe called “the most surprising shakeup of brass on a championship ballclub since Rogers Hornsby, playing-manager of the St. Louis Cardinals, was traded to the New York Giants after having won everything in 1926.” Kaese found Riddle’s release particularly mystifying because Riddle had always proved himself to be intensely loyal. In 1958 Johnny signed as a coach for the Cincinnati Reds. The following year, he coached for the Phillies, which was his final job in baseball. In 1958 Riddle went into sales in the beer business in Indianapolis. Around 1961 the family moved to Birmingham, Alabama, where he continued in the beer business for several years. He then went into the retail business in one of the large malls in Birmingham. Eventually the family moved to Connersville, Indiana, where one of their daughters lived. After a few years, they decided they didn’t like small-town living, and moved back into Indianapolis. Johnny Riddle died in Indianapolis on December 15, 1998, at the age of 93. He left behind his wife, Dorothy; children John, Bill, Pat, and Steve Riddle, Linda Weaver and Barbara Arnold; 19 grandchildren; and 17 great-grandchildren. He is buried in Oaklawn Memorial Gardens in Indianapolis. “Popular Indianapolis Indians Catcher John L. Riddle….” Indianapolis Star, 1998. Biographical and other information provided by Johnny Riddle, his son John L. Riddle, and his nephew, James Riddle. Sam Levy. “Riddle Unsolved.” Baseball Digest, April, 1951: 82. Kim Rogers. “Baseball Veteran, 90, Remembers the Early Days at Bush Stadium.” Indianapolis Star, June 30, 1996: B13. Edward Burns. “Bush Sizes up Sox and Likes their Looks.” Chicago Daily Tribune, March 14, 1930: 19. “Southern Pick-Ups.” Christian Science Monitor, April 6, 1938: 12. “Remarkable Play is made by Riddle forcing out Klein.” Daily Boston Globe, July 5, 1938: 6. “Old Johnny Riddle to Catch for the Reds.” Toledo Blade, August 17, 1944: 20. “Riddle May ‘Work’ at 3rd.” Milwaukee Sentinel, June 21, 1956: 10, part 2. Harold Kaese. “Coolness between Haney and Braves Coaches Apparent in Series.” Daily Boston Globe, November 5, 1957:13.